First thing is first: you ought to be very proud of me. Despite my HORRIFIC blogging habits as of late, I have been much better with my exercise and eating habits! I have been squeezing in (short), but effective workouts throughout the week and it has been wonderful! Last week, Jordan and I hit up a park that I haven’t been to in years for a short run/ strength workout. What I really enjoyed about the park setup was that there was a lovely 1-mile trail loop that you could run, but along the path, there were a series of strength stations! Many of them were QUITE familiar (ie: push-ups, sit-ups, bench-lifts), but some of them were pretty tricky! (I tried to locate a picture of one for you, but since I am not entirely sure of its real name, my Google searches ended up being “strength station where you lift your legs laterally and jump” and “lateral leg lift over bar playground”… needless to say, those terms yielded very few results. Anyway, I really enjoyed being able to split up our (very short) run with little bursts of strength training and it made me start thinking of ways to break up circuits like that on my own! I really cannot believe the difference I feel when I start running after a long hiatus. Granted, the first few days are rough, but once I get back into the groove, it makes me feel like a NEW WOMAN. Other than that, I have been busy, busy, busy with work! Which leads me to the tale of this weekend’s stay in a MOTEL. Yeah, that’s right kids, this girl stayed in The World’s Most Frightening Motel for two whole nights. Truth-be-told, I really am a pretty easy-going traveler. Sure, I love nice amenities, but if things are clean and fresh, I really don’t complain! But this, phew. This might take some therapy in order to recover fully. 1. When I walked in, one of the pillows from one of the beds was on the floor, there was no toilet paper in the bathroom, and it smelled like 1970. 2. In the morning, when I went to take my shower, the water temperature was SO uncontrollable that it fluctuated between ICE cold and SCALDING hot. So much so that I couldn’t even stay under it long enough to shave both of my legs. (Evidently, this was because other guests were using the showers at the same time. Well, duh! Why didn’t IIIIIIIII think of that?!??! A motel. Other guests? ONE SHOWER AT A TIME, PEOPLE. 3. Just before I went to check-out, I took a look under my bed to make sure that I didn’t leave anything behind. Fully expecting to find a sock, a magazine, an earring, maybe a quarter that fell out of my purse….boy, was I shocked to discover OPENED bags of snacks that were NOT mine. If only I had known that there were bags of dried fruit hiding under my bed. That really could have helped with those late-night snack attacks! Fortunately for me, I was able to spend one of those nights with Chloe (who has a magical ability to make rotten situations feel magically better) and we laughed the night away as we discovered all of the “fancy” amenities that the room *actually* had to offer. (Dead spiders, lamps that didn’t work, heaters that smelled like grandma’s closet….). Even though I’d NEVER stay there again, I must say that the memories ended up being WELL worth the frustration. I am fairly certain that my motel experience was karma’s way of getting at me for all of those terrible scary movies that I’ve made Katherine and Katie suffer through with me. OY. Needless to say, I am thrilled to be home again. I hope that you all had a great weekend and I will talk to you again soon!!! I hope that you’ve had a great week! Today was a big day in Brittany world. Today was my birthday! Today, I was thinking about all of the things that have happened in the last year; about all of the places that I’ve gone and things that I’ve done and people that I’ve met and things that I’ve learned. And now, on the workout front. First thing is first, my workout buddy Jordan (fourth summer in a row!) is soon to return and I couldn’t be happier. I am so excited to get back into the swing of things. I absolutely can NOT believe how much a new, semi-sedentary job can impact your lifestyle, but Jordan is a great motivator and having someone to answer to makes those daily workouts FAR more likely (and enjoyable!!). 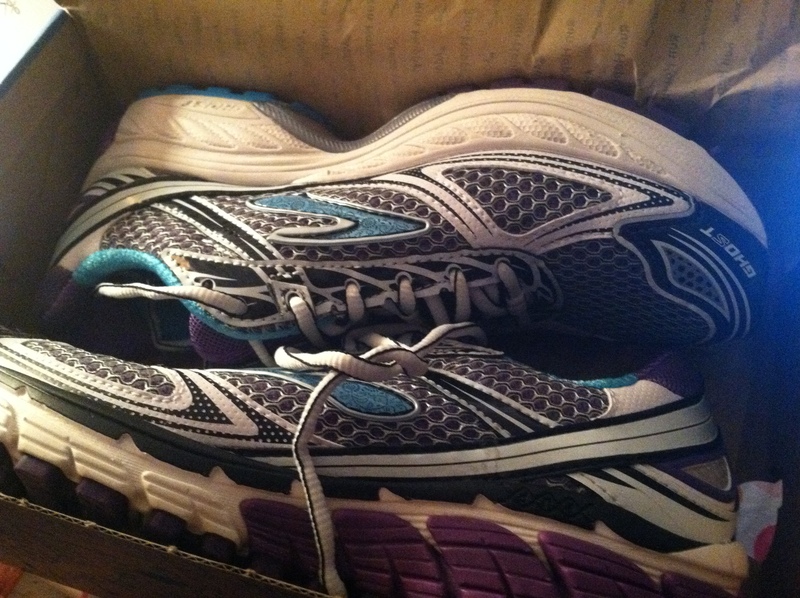 I have invested in a new pair of running shoes! If you recall, last summer, I invested in a pair of brand new running sneakers (the bright ones that are featured on the main banner of this website! ), but they just didn’t work for me. I actually didn’t even end up wearing them for the race that I initially purchased them for! Ironically, those shoes were selected for me by a “professional” at a running gear store, but something just wasn’t right! These little babies, on the other hand, I selected myself from Dicks. (They’re Brooks, if you’re interested…) I really didn’t expect to like them, but the second I slid them onto my feet, I knew that they could make all of the difference. They have GREAT arch support and the sole has just the right amount of give for me, but what really sold me was how well they worked on my rather wide, flat feet. Some of the other big name running shoes that I’ve tested (like Mizuno and Under Armour) are far too narrow for me. I have yet to try them on the move, but as soon as I do, I will be sure to update! Get ready, get set, let’s run!!!!!!!!!! A) So far, I have one eligible entry into the Color Vibe race giveaway! ONE. That is just plain nonsense, so I have decided to leave it open until MONDAY, MARCH 25TH. That’s it though. Really this time. And if no one enters, well then, I will just run twice. (NOT REALLY, get commenting!) Please note: In order to enter, you still must comment on the ORIGINAL post, NOT this one. Congratulations to our first winner, Brianna! Please contact me via e-mail and I can get you your winner’s code for your free registration! B) My apologies for my lack of posts for the last few days. I just returned, once again, from the Big Apple! This trip, unfortunately, did not run even close to as well as my last venture did. I bumped into just about every issue that I possibly could have bumped into on a business trip, but let me tell you, I am so, so grateful to be back home. Does anyone remember that Sesame Street song that Ernie sang about how he didn’t want to live on the moon? That is exactly how I feel about New York City. I like to visit, but I would NOT want to live there. Not even for a minute. “Although I might like it for one afternoon, I don’t want to live on the moon in New York City.” Also, can I tell you how ridiculously terrifying it is to drive a cargo van down the streets of Manhattan? It’s kind of like sailing a canoe in a bathtub. Anyway, I somehow managed to make it home alive and I am so happy to be here. But now it’s time to touch on the namesake of this post. Keeping balance. The night that I returned home from the city, I was so unbelievably tired that I couldn’t barely stand up straight. As soon as I walked through the front door, just the sight of a familiar face and my flouncing, bouncing, pouncing dog made me so, so happy I could have cried. Almost immediately, I crashed on an armchair and fell deep into sleep. Somewhere in the middle of the night, I managed to drag myself to bed, but I could barely turn out the light, let alone change into pajamas and actually get ready for bed. I was gone. And today, I had a day off. A day off that was still spent organizing things, running errands, completing random side jobs that I have continued to pursue and making sure that life was in order. In the midst of that, I was lucky enough to be able to spend some time with friends, but it wasn’t all relaxed time… because my weighty schedule was still rearing its ugly head. Suddenly, something occurred to me; I was losing the work-life balance that I promised myself that I would never lose again. If it hadn’t happened already, it was going fast. There are so many things in my life that are important to me: spending time with my friends, spending time with my family (heck, even spending time with my dog), making sure that I am always working towards making my life the best it can be, and making time for hobbies and the fun things that I enjoy doing. And yes, on that list, I must include work as well. Having a good job and working hard at it is very important to me. I have always been a pretty motivated person. I enjoy taking on challenges and tackling them, but at times, I take on a few too many challenges at the same time and inevitably end up dropping a ball along the way. I know what happens when you don’t make time for what’s most important. I spent the better part of seven years doing that. I never really had the time to be me. 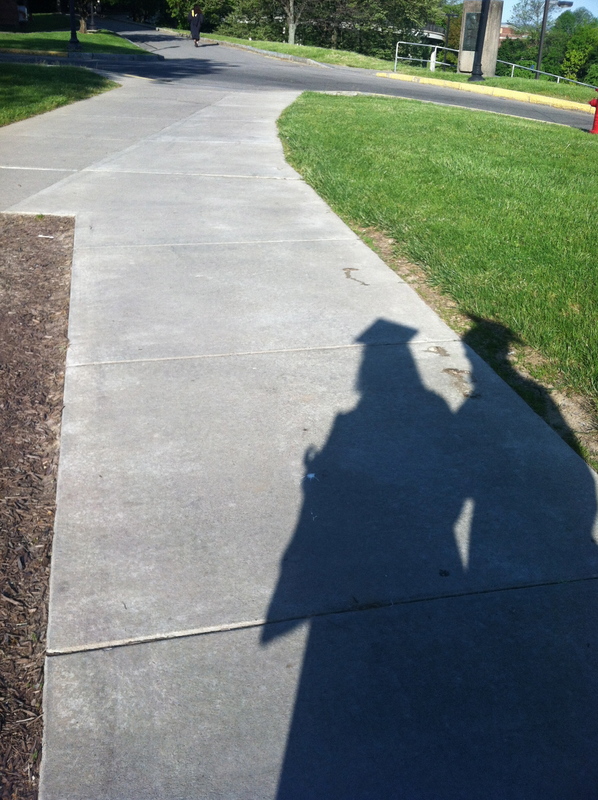 I took too many course credits (even in high school! ), I tried to keep up with too many activities, and I worked far too many hours. So now, I am left with a critical question– how do I make positive changes to ensure that I never, ever again feel like I’m losing touch with terra firma? I don’t want to be speeding from thing-to-thing like the Road Runner any more. I want to be present and to make the time for what matters most to me, from work to play to friends and family. And here is my jackpot question for you. How do YOU make sure that you have a healthy, maintainable work-life (or play-life, or family-life, or friend-life) balance? What helps to keep your schedule in check? I hope you had a great day and I will talk to you all tomorrow. And don’t forget to enter the giveaway!! Today’s post is sponsored by The Color Vibe! I am SO excited to share this giveaway with you as it holds a place very near and dear in my heart. 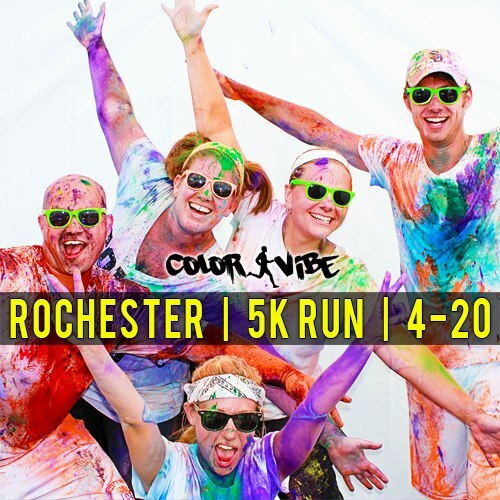 Here’s the deal: The kind people at The Color Vibe have generously provided me with two free registrations to the 2013 Rochester Color Vibe (April 20th!). In order to enter-to-win, all you need to do is comment on this post at any point between tonight, March 15th and NEXT WEDNESDAY (March 20th) to be entered into a random drawing! 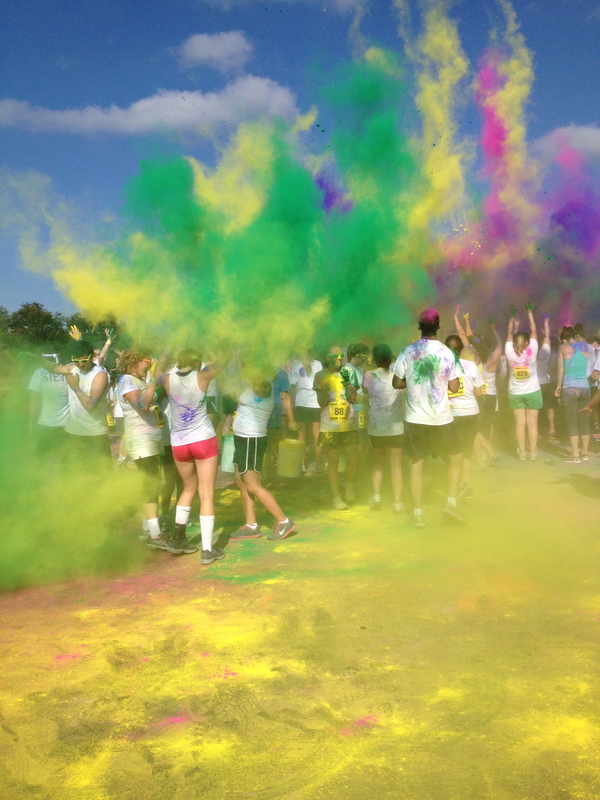 Just tell me why you want to run in a 5k and why The Color Vibe sounds like fun to you. Special: Get an EXTRA entry into the drawing by sending a tweet to #thecolorvibe and #5ksCoffeeBeans to the effect of “Hoping to win a registration to the Rochester 5k!” Then, comment on this post to let me know you did it and you’ll get an extra entry. What’s new at the 2013 Run? Think Dance Party. Everything from the music at the event to the number of runners will be huge this year! This year, the sound and music will be handled by a major production company– complete with a DJ and emcee for the entirety of the event. The number of runners has blasted from about 1,500 to nearly seven thousand. There will be more color. More sound. More people and way more fun. Get your white t-shirts, get your white shorts, grab your friends and get ready to enter. Remember, you have until WEDNESDAY, MARCH 20th to enter. I will announce the winners that night (there are two passes available and there will be TWO different winners!). And now, for those who care, just a little bit about how I came to discover the Color Vibe in 2012. At the end of my senior year, I fell into a bad, bad cycle. I stopped going to the gym because I just didn’t have enough time anymore. The stress and perpetual presence of fast-food at the dining halls and unlimited access to Starbucks (in all of its pastry/high-calorie latté glory) took a toll on me. I hated the way that I was treating my body and I didn’t like the way I looked. As soon as I was re-settled back at home, I knew that it was time to make some serious changes. I had always been a healthy eater and I loved going to the gym, but a combination of over-scheduling, high-stress and unique circumstances just made gym time unrealistic and eating healthfully more trouble than I cared to grapple with. Running in a “race” had always been on my radar as a “someday” goal. I thought about 10ks, half marathons, but decided to start simple with a 5k- the 3.1 distance. I knew that I had to find a fun one to motivate me. That’s when I stumbled across The Color Vibe. Immediately I registered. I talked two friends into doing it with me and the rest is history. 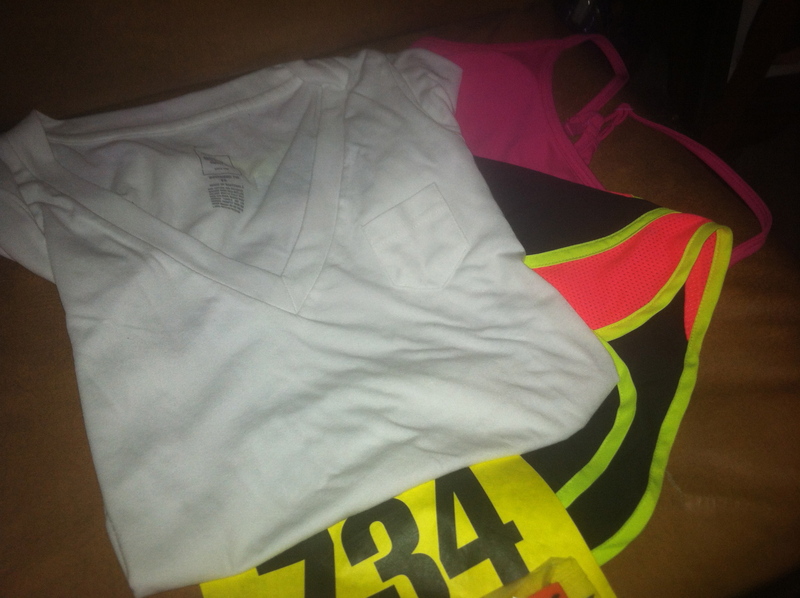 When it came time to Color Vibe, I was rearing and ready to go. I felt better than I had in many, many months and I was looking forward to the event. The course was simple. The run was quick. 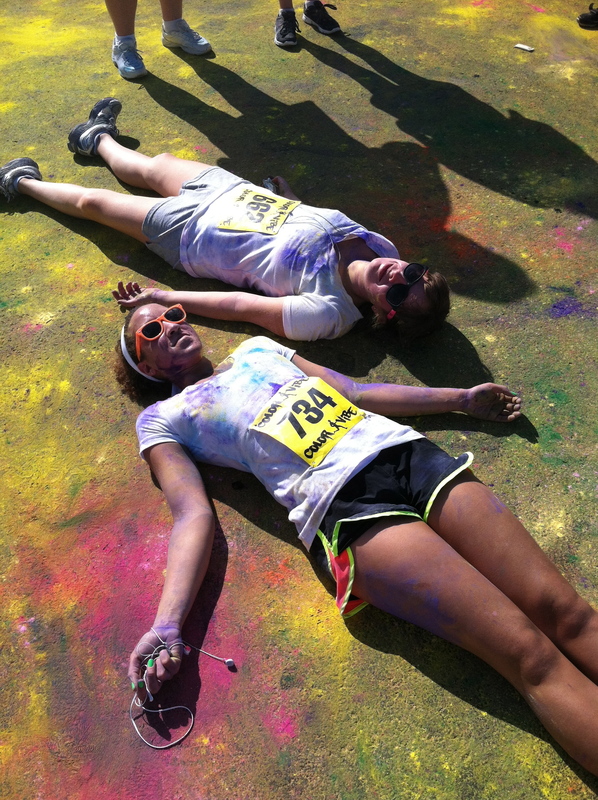 When the race was over, the color party was so much fun. Friends were dousing friends in color powder, the music was blasting, and people were rolling around on the pavement to soak up every last ounce of color. The Color Vibe is unlike anything I have ever experienced before. The positivity and high energy of the event left me on that famous “runner’s high” for days. I cannot wait to do it all again, and I hope you’ll join me! You can read my full recap of the event here. Guys, today, I get to make the announcement that I have been waiting to make for WEEKS. Stay tuned. I spent 95% of my day absolutely convinced that it was Thursday and the other 5% falling asleep standing up. I hope YOU had a fantastic day sans-confusion. Tonight, I had a babysitting gig for myself after work. Ever since accepting my new position, I love my babysitting gigs even more than I did before. Now that my professional life has taken quite a turn (different industry, different feel, very different location), the sporadic hours of babysitting here and there are a welcome change of pace. Spending time with the kids who I’ve known (in many cases) since they were born is so much fun. They’re all growing up and learning new things and getting taller and it’s so great to have that little built-in reality check in my life. Whenever I babysit, especially my youngest charges, I am always shocked by how many different sides of myself come through in that role. One moment, I’m playing dress-up, or putting on a puppet show with Strawberry Shortcake dolls, and the next, it’s all about making boo-boos disappear and promising that everything will be OK. Suddenly, I am the one checking under the bed and reassuring them that the sounds that they hear are trains, or birds– anything but monsters. It really is a very cool experience. Now, as I mentioned earlier, I was falling asleep ALL day today. Considering the fact that each time my computer took just a little too long to load today, I feared that I would fall asleep on my desk, I made a pit stop after work: a pit stop to Starbucks. That’s right, I BROKE MY OWN RULE. The “Only Buy Starbucks on Meeting Mornings” rule. Bad Brittany. But let me tell you, if you are in desperate need of a serious jumpstart, allow me to recommend the Café Misto with a pump of vanilla syrup and one shot of espresso. WOAH baby. Goooood morning, America. The rest of my night was quickly consumed with a blurry dinner that consisted of a bagel and some scrambled eggs. AND NOW. For the big announcement. 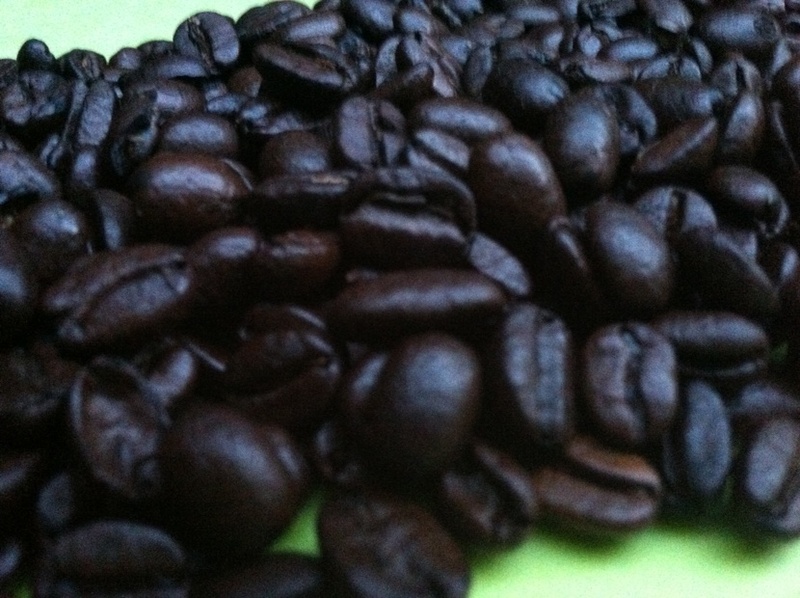 5ks & Coffee Beans will be holding its FIRST EVER, real-life GIVEAWAY! TOMORROW, MARCH 14th, I will be presenting the giveaway and providing you with several different options for entering. This is a good one, friends. Especially for my NYS running buddies. It’s something that is very near and dear to my heart and that I am so, so excited to be offering to you. Stay tuned, readers! Be sure to visit tomorrow for the official details!! Let’s begin with story time! Once upon a time, there was a girl named Brittany. Brittany really didn’t enjoy running very much. 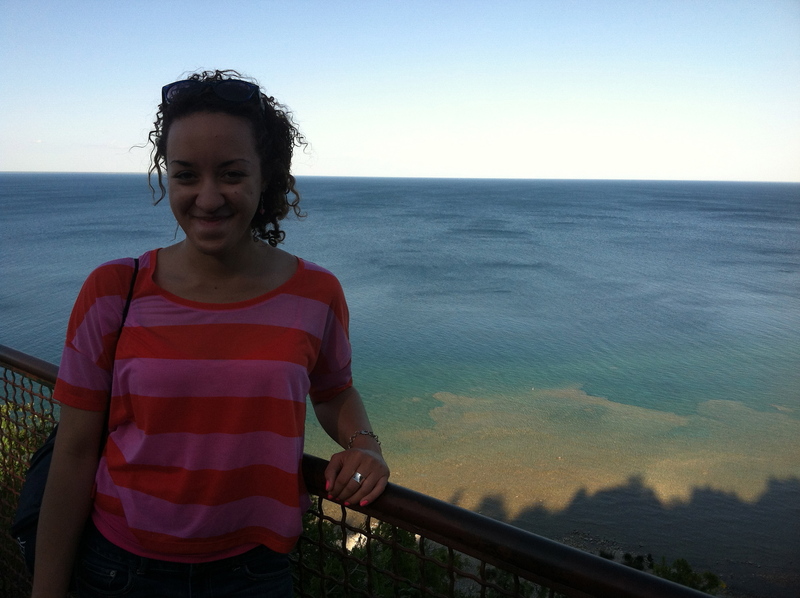 Back in her high school days, the infamous PACER fitness challenge that happened biannually sent shivers down her spine and put fear in her heart. Throughout college, Brittany began to incorporate some running into her (haphazard) workout routine. Slowly, she learned that she could actually run four whole feet without feeling as if she were dying! Then 2012 came around. 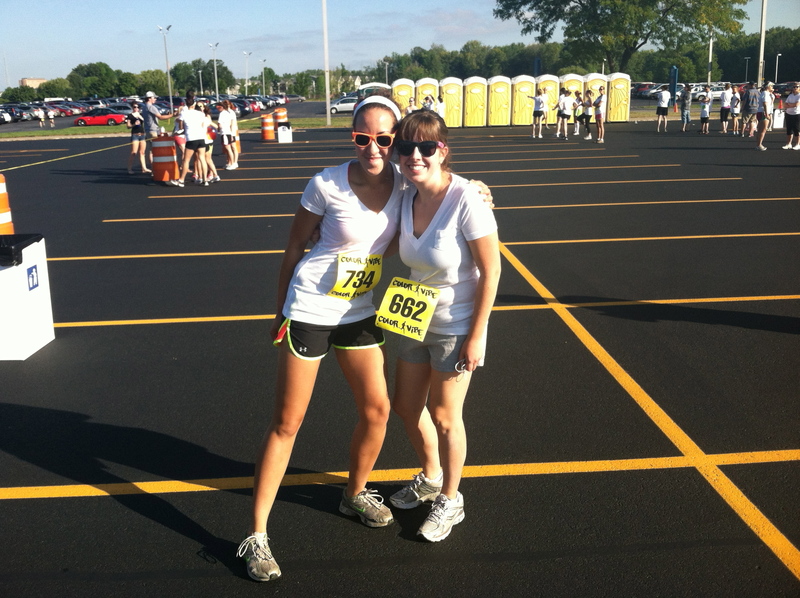 That year, Brittany decided to run a 5k. It was a random decision, but one that proved to be a very positive experience. First it was the training schedule. Training for the race taught Brittany to be disciplined and consistent about her cardio workouts. Then came the race itself. The race taught Brittany that hard work can help you to conquer things that you never thought you could conquer. It taught her that a healthy challenge can help you to grow as a person and show you what you’re really made of. It showed her how a well-executed race (such as the Color Vibe) can make the whole experience extremely memorable and meaningful. Guess what I did today? I registered for my first ever half marathon! 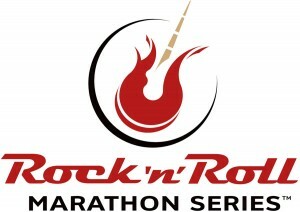 It is a part of the “Rock’n’Roll” marathon series and I am extremely excited. I have heard very good things about this race series, evidently the environment is a lot of fun and the courses are generally pretty reasonable. 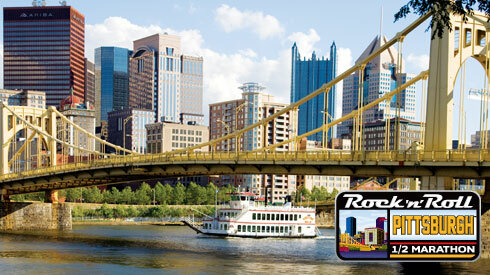 Mine will take place in the lovely hometown of the Steelers. The Mother Planet of Heinz Ketchup. Even though I know it will be quite a challenge for me and that the training process will be quite a commitment, I am so, so excited. After running the 3.1 miles of the 5k, I felt such a sense of accomplishment. That was the first and only time that I ever experienced the elusive “runner’s high,” and I felt like a million bucks. (Until the next day, that is.) I am hoping that this longer distance will also prove to be a very positive experience. It’s official now, I have registered and I can’t get a dime of my fee back! (In all honesty, despite the fact that the actual race is months away, my main impetus for signing up so early was to have a goal in the back of my mind. Something to work towards and something to inspire my health kick to continue throughout the year.) I am also hoping that having a specific training regimen to follow throughout the spring and summer will give me extra reason to stay active. Things are starting to get busier and I know that my life in the summer will be a tad chaotic, but having this race on my radar will give me an irrefutable reason to run. This spring will bring yet another 5k, let’s hope this one goes as well as the last one did! Have a great night and I will see you all tomorrow! Holy workout! (For the record, I didn’t actually do it as punishment, but it’s fun to pretend. 😛 ) As strange as it’s going to sound, I actually REALLY liked running on an incline and felt that I might actually be able to do it for even longer than I did. For some reason, the incline took some of the drudgery out of treadmill running. It was like I was on a mission! (A mission to climb a never-ending mountain…) I would really, really love to be training for a race right now, but I haven’t found one that I was excited enough about to actually register for (races are QUITE pricey!). Beyond that, the ones that I have found, are a little too soon to realistically train for in a safe and healthy way, which we are ALL about here at 5ks and Coffee Beans! There will be ZERO running-related injuries on my watch! Next, we went to the floor to complete an “ab workout” that was somewhat half-assed and morphed into sitting on our mats and planning our futures and also detangling the present.